There was a time – not all that long ago, really – when the notion of a cocktail conference or convention would have been downright bizarre. What exactly would have been the content of a cocktail seminar in, say, the 1990s? The finer points of making a screwdriver? Even as recently as 10 years ago, when America was joyfully rediscovering the merits of a drink made by a skilled bartender using high-quality spirits and fresh ingredients, industry gatherings were small, relatively rare, and fairly narrow in scope. One need look no further than Thirst Boston to appreciate how the cocktail industry has evolved since then. This four-day day conference, now in its second year, opened with a black-tie gala last Friday night and closed with a bartender brunch on Monday morning. In between were two days’ worth of focused seminars, special events, hosted bars, parties, after parties, and vendor showcases, all inspired by and devoted to our renewed love affair with the cocktail. And judging by the diversity of Thirst’s attendees, it’s a love affair that exists on both sides of the bar. 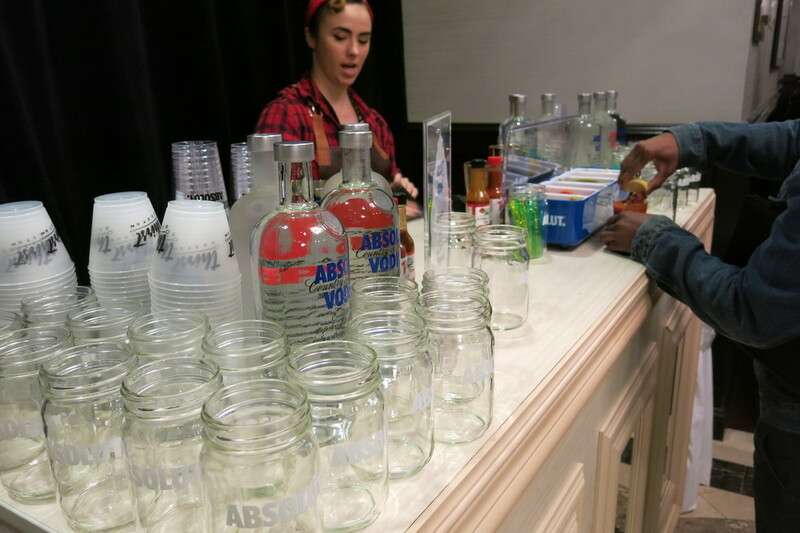 While many of the 20+ seminars had broad appeal, like “From Connery to Cruise: Cocktails in the Movies,” and “All for Rum and RUM FOR ALL,” others were more workshop-oriented, such as “The Art of Preparing Vermouth” and “Carbonation Station.” But even the most industry-specific presentations drew a mix of professional bartenders, amateur mixologists, and people who just appreciate good drinks and the process behind them. With no shortage of interesting topics to choose from, the biggest challenge is deciding which seminars to attend. 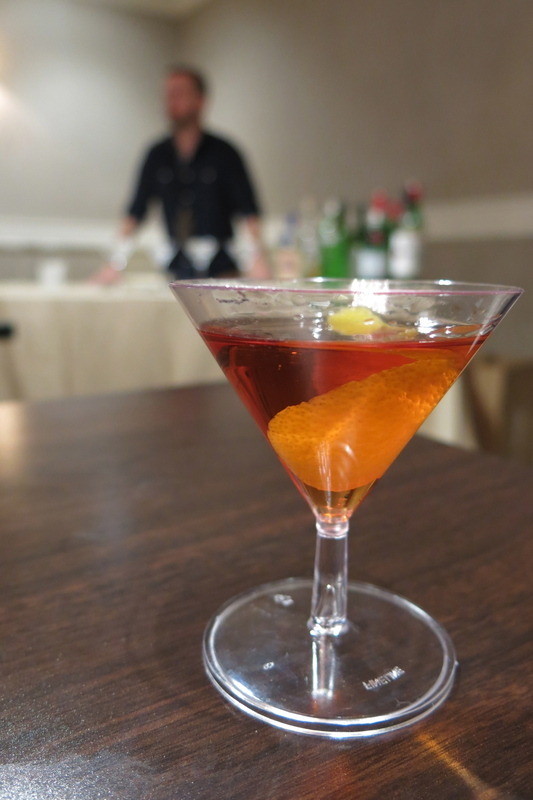 I started with “The Aperitif Hour,” presented by renowned bartender/writer Naren Young and local mixologist Nick Korn. Aperitifs are something I’ve long struggled to enjoy, and it’s only recently that I’ve started to understand the appeal of these bitter herbal liqueurs. The proceedings began with a punch that Nick made with oleo-saccharum, tea, Aperol, gin, and Prosecco, topped with grated nutmeg. While we sipped the punch, Naren walked us through a brief history of apertifs, explaining various types and uses and sharing some of his experiences with the liqueur, both as a bartender and drinker. And then began the parade of Negronis. Our first sample was Naren’s Chocolate Negroni, made with gin, Cinzano vermouth, Campari, white crème de cacao, chocolate bitters, and black cardamom tincture. 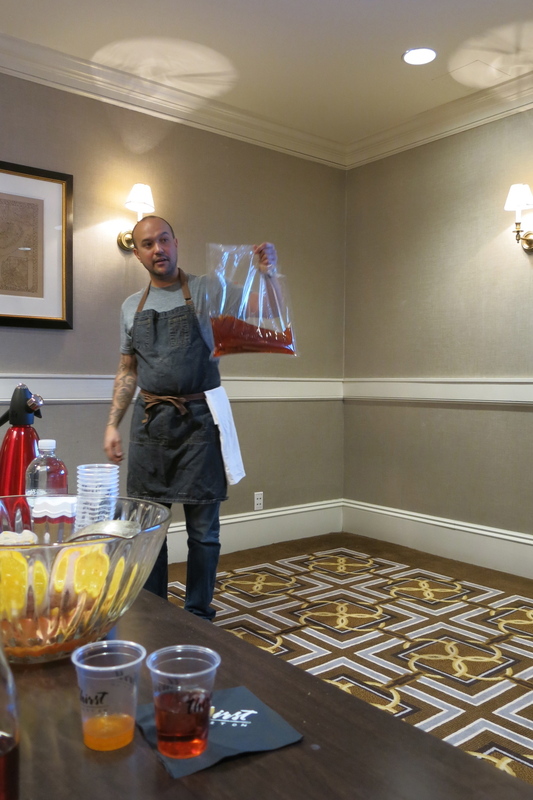 Next up was a bottled Champagne Negroni and a short lesson in how to carbonate cocktails. The most intriguing portion of the seminar was Naren’s in-depth explanation of “sous vide” cocktails, a method of spirit infusion done with a vacuum seal machine normally used by restaurants to quickly bring food to their appropriate temperatures (there is no way I could do justice to this concept by trying to elaborate on it). The idea of a craft cocktail in a plastic bag might invite a little skepticism, but the lavender and lemongrass Negronis that came out of them were exceptional. I drink a martini about once a year. And as soon as that first sip crosses my lips, I remember why I don’t have them more often. My disdain for this iconic drink has long been a source of personal frustration; I want to like it. But I figured that if I was ever going to learn to appreciate the martini, attending a presentation by the makers of Tanqueray gin and Ketel One vodka might not be a bad idea. In fact, it was a great idea, because I made a valuable discovery: I don’t dislike martinis; I dislike poorly made martinis. Led by Tanqueray national brand ambassador Rachel Ford, the session began with a discussion of the various types of gin, the spirit’s versatility, and the relatively simple botanical blend of Tanqueray. With Tavern Road bar manager Ryan McGrale demonstrating the ins and outs of proper martini-making, Rachel then expounded upon the long history of this elegant cocktail, beginning with its presumed forebear, the Martinez. From there we tried the traditional dry martini and a few variations, such as the 50/50 martini, made with equal parts gin and vermouth, and the James Bond-inspired Vesper martini, made with vodka, gin, and Lillet Blanc. 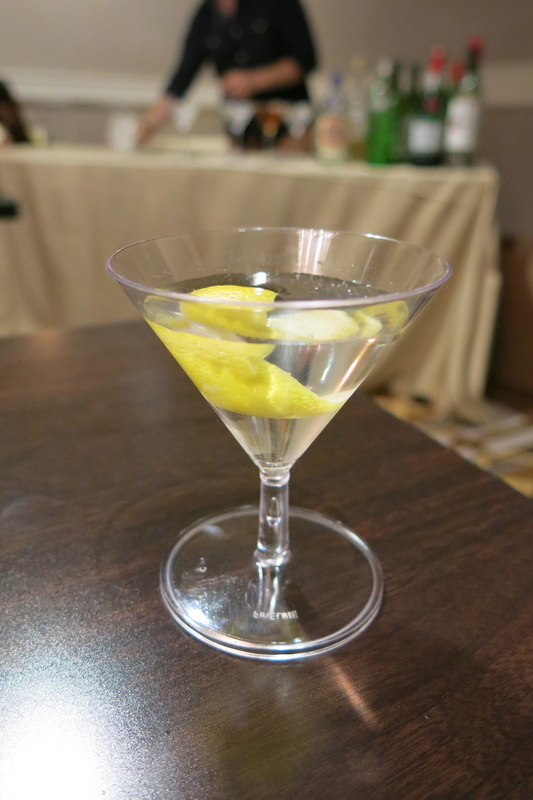 That led to a discussion of the fictional spy’s “shaken, not stirred” mantra – and how badly that oft-repeated phrase has damaged the martini’s reputation. Stirring the spirits brings out their flavor and gives the cocktail a smooth, silky texture, whereas shaking makes for a clouded, foamy drink. Mr. Bond can have his martini however he wants it, but “stirred, not shaken” is how I’ll take mine. And no olives, thank you very much. It’s odd to think that there was a time when tattoo parlors were illegal in Massachusetts. Then again, there’ve been a lot of weird laws on the books in this state, so maybe it’s not that strange. It’s also pretty funny to recall the days when the most common companion for rum was Coke. But tattoo culture is huge these days, and the popularity of small-batch spirits has taught us to appreciate rum the same way we enjoy quality bourbon and scotch. That, in turn, has contributed to a renewed respect for tiki drinks, once maligned as overly sweet cocktails you’d only order in a Polynesian restaurant. The makers of Sailor Jerry rum brought these two worlds together for “Tales of Tattoo and Tiki Culture,” a seminar that celebrated the resurgence of tiki drinks and examined both the popularity and the remarkable artistry of tattoos. There’s an obvious historical connection there – rum was once considered the spirit of those who spent their lives on the high seas, and sailors were known for their tattoos. As much as I’d love to tell you more about this seminar, I’ll be honest – after a morning of aperitifs, an afternoon of martinis, and nothing more than cheese and crackers to eat, I was fading fast and decided to duck out a little early. It was fascinating stuff, and I’m a big fan of Sailor Jerry; but the class was to culminate with a lesson in coring a pineapple for a tiki drink, and I was cognizant enough to decide that my handling a sharp object and a large, unwieldy fruit was in no one’s best interest. I will add that no one was overly impressed with my Negroni Week temporary tattoo, which I’d gotten at the aperitif session. Whatever. With a fair number of lighthearted topics to choose from, like cocktails that have appeared in movies and literature, it’s telling that a seminar devoted to entrepreneurship was among the first to sell out. Innovation is the cornerstone of this craft cocktail renaissance, and that extends beyond just the ability to come up with great drinks. The passion and demand for creative cocktails has spawned a small universe of new products – specialized glassware, bar tools, bitters, small-batch spirits, recipe books, you name it. In “Entrepreneurship in the Spirits Industry,” presented by Hendrick’s, a panel of three experts spoke about their experiences in going beyond cocktail creation and developing products that are helping to propel the industry forward. It would be difficult to overstate the impact Jackson Cannon has had on Boston’s cocktail culture. He was the opening bar manager of the renowned Eastern Standard and later the Island Creek Oyster Bar. His Hawthorne bar is considered one of the best cocktail bars in the country. Anyone with a resume like that is entitled to “a vanity project,” which is how he characterized the genesis of the Jackson Cannon Bar Knife. Thinking it would be pretty cool to have a customized knife to give to friends and regulars, Jackson met with R. Murphy Knives, a knife manufacturer that’s been around since 1850, and looked through hundreds of their designs. The old-fashioned model that would eventually become his customized bar knife was originally designed for cutting shoe leather. Many bartenders will immediately recognize the knife by its oddly shaped, rectangular blade. And chances are, they’ll find it pretty useful, too. The sharp blade doesn’t dull quickly, and the squared-off tip is perfect for notching fruit, removing seeds, and making spiral-cut citrus peels. Hawthorne bar manager Katie Emmerson does a little knife work. Chicago-based mixologist Charles Joly apparently knows a thing or two about making drinks. He was named the best bartender in the world after winning the Diageo World Class 2014 cocktail competition in London, so…there’s that. Despite the international accolades, Charles’ venture into entrepreneurship has humble origins. He often found himself often being asked for drink recipes by customers, which he was happy to share – even when one customer called him at the bar, during a busy shift, to ask how to make a particular cocktail at home. So he had an idea – why not bottle the drinks? Bottled cocktails, of course, are nothing new; dozens of them have been on store shelves for years. The problem is, they’re universally disgusting. Charles wondered whether he could make good drinks, with spirits he’d use in his own bar, and put them in a bottle. We tried samples of his Moscow Mule and Paloma, and I’ll give them the highest compliment I can pay to any bottled cocktail – they taste exactly the way they should. Products like these are ideal for someone who doesn’t have the time or inclination to make the drinks themselves, and while more discerning drinkers might be skeptical of a pre-made cocktail, it’s hard to argue with the results. I’ve talked about gin with Hendrick’s brand ambassador Jim Ryan at a number of events over the years, but this was the first time I ever heard him speak at length about the spirit industry in general. His thoughts on the growing opportunities in this neo-golden age of the cocktail were interesting and informative. But what impressed me more was hearing that Hendrick’s, despite its popularity and stature, is still looking for ways to nurture creativity. 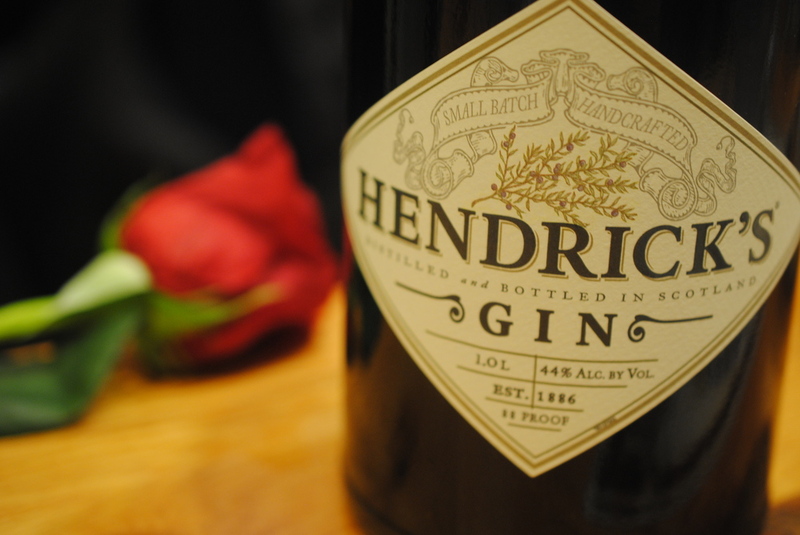 Maybe I’m overgeneralizing, but I always figure that a well-established brand like Hendrick’s, owned by a huge corporate distiller like William Grant & Sons, would find a formula that works and stick with it, valuing consistency – and the bottom line – above all else. But while Hendrick’s isn’t tinkering with their gin recipe (and well they should not), that doesn’t mean they’re inhibiting their distillers’ freedom to be creative. Hendrick’s Quinetum is a quinine cordial that combines lavender and orange distillates with a host of other botanicals. The small, dark blue bottle is modeled on a poison bottle that someone at Hendrick’s found in an old shop. The flavor is sweet and the consistency somewhat oily, and it’s designed to be mixed with the gin or in a Hendrick’s and tonic. The Quinetum project is still very small – Hendrick’s only made a few thousand bottles, and they aren’t available commercially. Instead they’ve been sent to bars in a few cities (one of which is NOT Boston; ahem) for mixologists to experiment with. You won’t find Hendrick’s Kanaracuni on store shelves, either, and probably not even in a bar – there are only 460 bottles in existence. In 2013, a team led by Hendrick’s’ master distiller ventured to the Venezuelan jungle in search of a new botanical to be used in a very small batch of gin. They eventually found the Scorpion Tail plant, so called for its resemblance to the poisonous arachnid. Scorpion Tail is the key ingredient in Kanaracuni, named for the Venezuelan village that served as the team’s home base. This floral, lip-tingling spirit has notes of coriander, anise, and citrus, giving it something of a tropical essence. Products designed by people who work in this industry have a special, genuine kind of quality to them. A bar knife designed by a top bartender and bar owner; a bottled cocktail made by a celebrated mixologist; I think there’s more value in that than a celebrity chef allowing his or her name to be used on a kitchen tool or a venture capitalist deciding to dabble in the spirit business. And in the case of Jackson’s knife and Charles’ pre-made drinks, both explained the steps they’ve taken to ensure quality, eschewing shortcuts that could easily make them more money. Hendrick’s, of course, has the capital to fund projects like trips to Venezuela or designing cordials that may never be put on sale. But the desire and willingness to innovate is what unites a large distilling outfit with much smaller entrepreneurial projects like those led by Jackson Cannon and Charles Joly. And the takeaway is that there is no shortage of opportunities in this exciting, ever-growing industry. Of course, Thirst Boston isn’t all about industry trends, marketing, and cocktail history. There’s also plenty to drink. Hosted bars are set up throughout the day. Saturday morning opened with a French Café, serving up mimosas and pastries. In the afternoon, William Grant’s World of Whisk(e)y Bar took over. That’s a pretty impressive lineup of whiskies – Glenfiddich, Monkey Shoulder, Hudson, and a few other William Grant spirits. They factored into drinks like the Hunter’s Mark, Monkey Boulevardier, and the Irish Mule. Samples of Hudson were available neat or on the rocks. Various bars from Maine and Rhode Island brought some of their favorite cocktails and other products to share in a New England-themed mini bar crawl. The Schooner Punch, from Central Provisions in Portland, Maine. 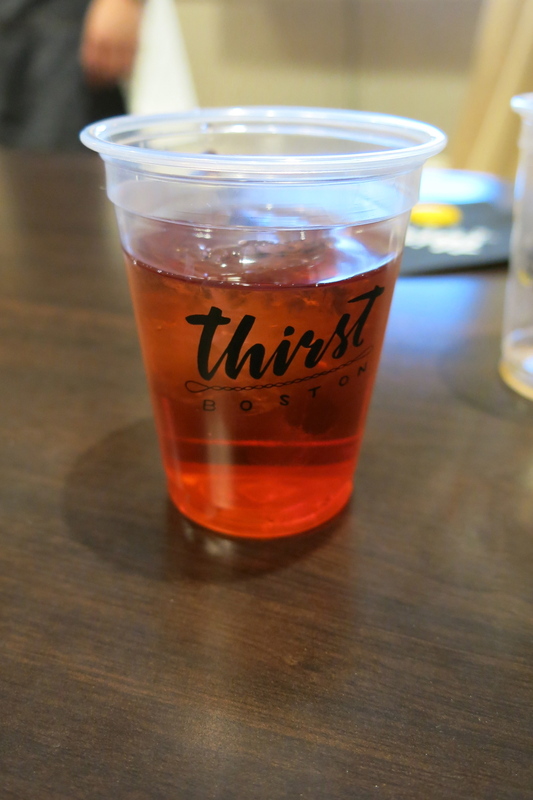 The Boston Shaker, the Somerville barware boutique shop, also had a pop-up presence at Thirst. I was sure to buy something – and if you understand the significance of this picture, then be jealous. Be very jealous. On Sunday, things got started with a “Bloody “Bar” sponsored by Absolut, with plenty of spicy vodka options and garnishes to choose from. Later that day, Plantation offered a much-needed Daiquiri Time Out. And in the function room on Sunday afternoon was the New England Craft Showcase, and it was just incredible to see so many top-notch regional distillers and brewers under one roof. I got to try Grand Ten’s white rum and their Craneberry cordial, which head distiller Spencer McMinn told me differed considerably from the previous batch. 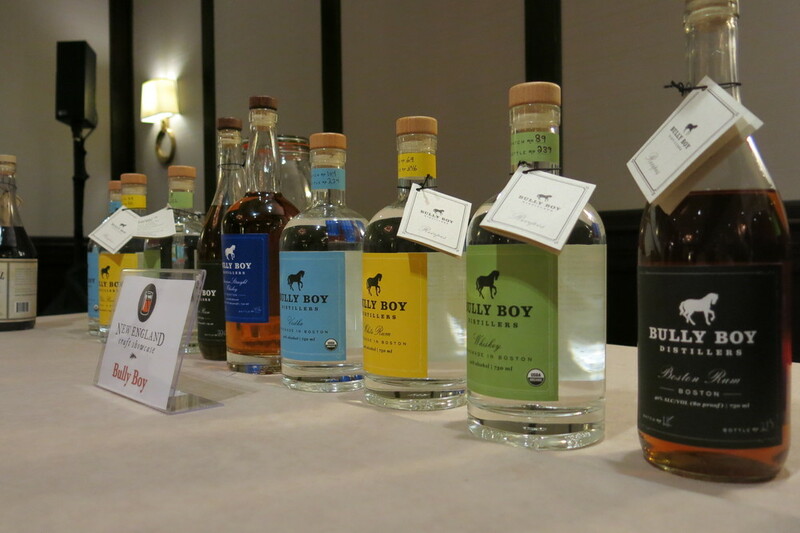 Boston’s other distillery Bully Boy, was right nearby, offering samples of their expanding line. Berkshire Mountain Distillers was on hand with spirit and cocktail samples, along with Privateer, Portland’s New England Distilling, Vermont’s Mad River Distillers, and so many more that I can’t even begin to include here. But hopefully they’ll all be part of Thirst next year, too. I’d give anything to see a panel hosted by a few local distillers, discussing their experiences in the increasingly popular craft spirit movement. And the very fact that we can look forward to next year is significant in itself. Thirst Boston is a fairly small show compared to some of the other cocktail events in the country, like Tales of the Cocktail. But like the industry itself, it’s only getting bigger.